Moe’s Tires & Wheels in Baton Rouge has a wide variety of products to fit any vehicle, from a compact car to a large truck. 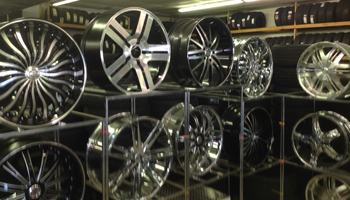 Moe’s Tires & Wheels has rims for any size vehicle, including sedans, station wagons, pick-up trucks, vans, and more. Choose from a gloss black painted finish, chrome plated, white painted, clear coated, polished and more. Just a few styles include 8, 7, 6, or 5 spokes, a circle of round cut-outs, fork end spokes, and honeycomb designs. Standard sizes range from 14x5 to 18x7.5, but we also have customized sizes available. From simple and functional to elaborate designs that will draw attention to your tires, we have a wide variety to choose from. Moe’s Tires & Wheels also provides the services you need to go along with your tires and rims. This includes computerized tire balancing. It’s important to balance your tires regularly to maintain even tire wear and ensure you are driving with optimal tire pressure that is safe for operating your vehicle. Related to balancing, our Baton Rouge auto technicians also offer tire rotation to help you get the most use out of your tires. We’ll put your car up on a lift, take the tires off, and secure them in different locations, all within about an hour. If you get a flat tire, leak, or your rim gets bent, we offer tire and rim repair so you can avoid replacing them. For flat tires and broken rims than cannot be repaired, we will replace the tire or rim the same day.